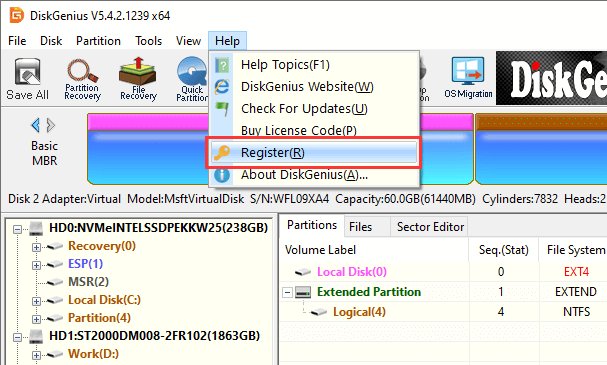 This article includes step-by-step methods to register DiskGenius. You can register the software online or offline easily after getting the license code. 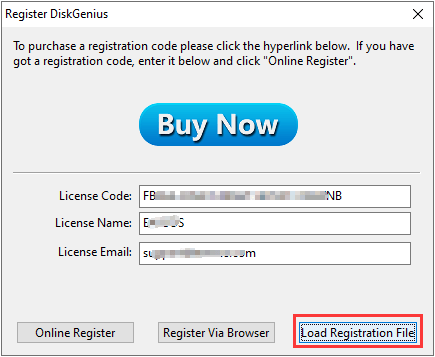 If you do not have license code, you can buy one from here: https://diskgenius.com/buy.php. 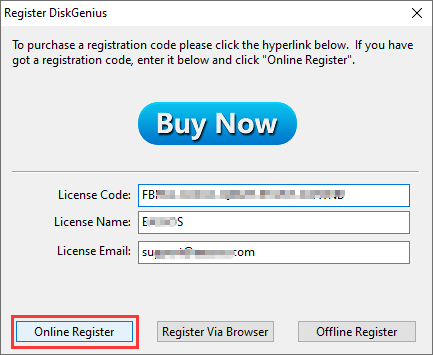 Step 2 Enter your License Code, License Name and License Email, and click "Online Register" button. It is recommended to Copy & Paste license code instead of entering all characters manually, as license code is space and case sensitive. 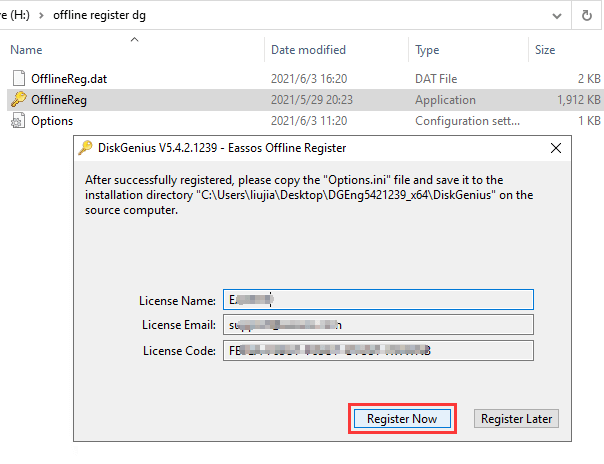 If Internet connection is not available on the computer where DiskGenius is installed, you can still register it via offline activation. 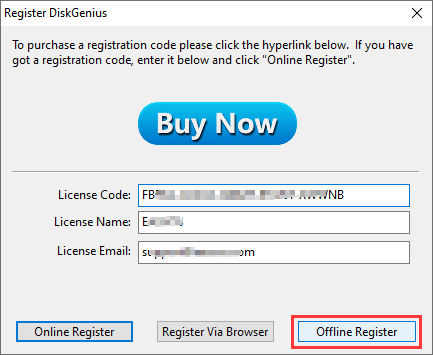 Step 1 Enter your license information and click "Offline Register" button. Step 2 Click "OK" button on the popped-up message box which prompts DiskGenius will generate three files. Choose a location to save these files. 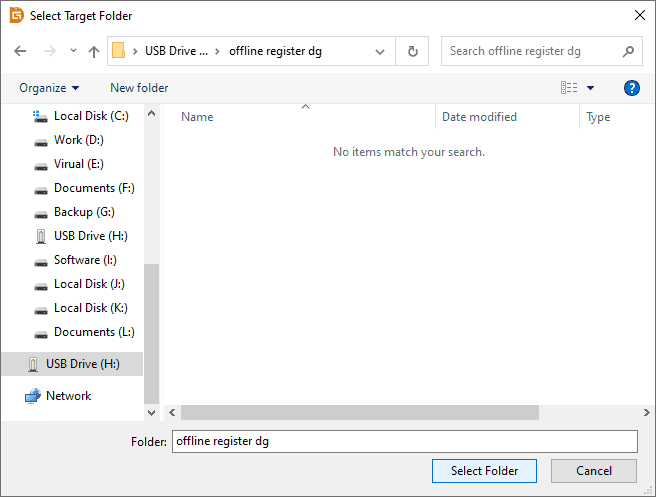 Offline registration files are saved to the specified location. Step 3 Copy all three of them to a computer which has access to the Internet. Then double-click "OfflineReg" file and click "Register Now" button. Step 4 Copy the "Options" file back to the folder where DiskGenius is installed and replace the existing one. Then the software will be registered successfully.